Walt Disney Studios announced this week that they will be kicking off a Blu-ray road tour that will be hitting malls throughout the US, during the last 5 months of 2007. The event will spend 3 days at each mall, before packing up and heading out to the next destination. The focus of this tour will be the Blu-ray Disc format, specific Disney movies on Blu-ray and other interactive features of the Blu-ray format. The event is sponsored by Panasonic, who along with other Blu-ray format backers, are hoping to increase consumer awareness of Blu-ray Disc and expose a wide variety of people and demographics to the technology. The organizers believe that they can find this diverse audience within shopping malls around the nation. “At each stop, giant blue towers will feature widescreen monitors. And at more than a dozen interactive “stations,” people can preview Blu-ray versions of recent Disney animated hits Cars and Meet the Robinsons, and play the Liar’s Dice game from the Blu-ray edition of Pirates of the Caribbean: Dead Man’s Chest. 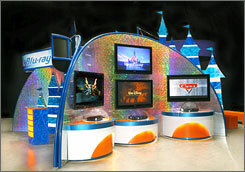 This announcement and promotional tour illustrates that Walt Disney Studios are still highly dedicated to the Blu-ray format. The combined power of multiple CE companies and multiple Blu-ray exclusive studios makes it tough for HD DVD companies to compete with the Blu-ray format. It is also interesting to see that the films ‘Cars’ and ‘Meet the Robinsons’ will be appearing on Blu-ray Disc. No formal street date has been announced for Blu-ray versions of these films, but they will likely hit shelves sometime in the 4th Quarter of this year. Once released, ‘Cars’ will mark calendars as the first Pixar film to be released on a high definition format. I am interested in going to see what this roadshow has to offer, but unfortunately it will be in my area from Dec 21 – 23, which is when I will most likely be out of town. Check the USA Today article for tour dates and locations. USA Today via HighDefDigest. It looks like Disney has a 6 December date on Cars.